How To Find Us | H.A.W.K.S. Coming from the North side of Baltimore, take the I-95 exit North to exit 80. 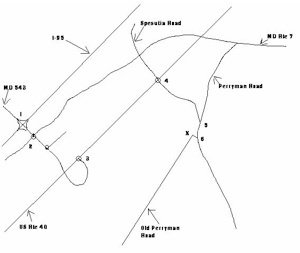 (past 3 traffic lights) and the road makes a 180 degree left turn, and ends on US Rte 40. Take a right here. You will be heading Northeast. Just about 1 mile later you come to a traffic light at Spesutia Road. at Perryman Road. Look out your passenger window and you can see the hall, about 100 yards away. Turn right here, there is a yield sign. Stay in the right lane. Turn right at the next intersection. This is the cutoff to Old Perryman Road. You are facing the hall. About 50 feet later turn right again, and *immediately* begin turning left into the drive in front of the hall.